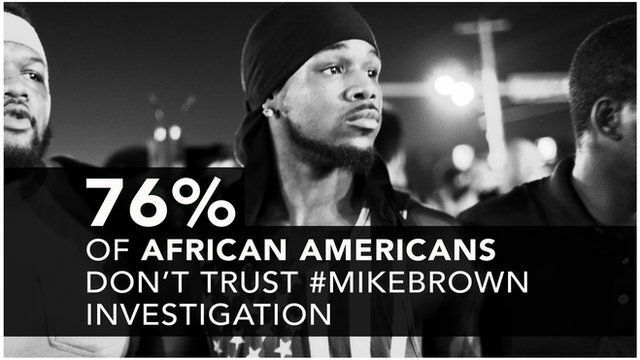 How black and white America view Ferguson Jump to media player A new poll by the Pew Research Center has found US reaction to the police killing of Michael Brown falls along distinct racial lines. Obama: Violence 'undermines justice' Jump to media player US President Barack Obama has said that looting and attacks on police officers following the death of an unarmed teenager in Missouri "undermine rather than advance justice". Lawyer: 'Witness accounts were true' Jump to media player Unarmed teenager Michael Brown was shot at least six times, leading to his death on 9 August, lawyer Benjamin Crump said on Monday. Mother calls for arrest Jump to media player The mother of the unarmed black teenager shot in Missouri, US, has called for the policeman who shot her son to be arrested. Jackson speaks out on Ferguson death Jump to media player Civil rights activist Rev Jesse Jackson has accused police of trying to "besmirch the reputation of Michael Brown", the unarmed teenager shot dead by a police officer on 9 August in Missouri. 'We had to elevate response' Jump to media player Police in the US town of Ferguson say they have "no alternative" except to elevate their response as protests continue over the shooting of a black teenager. National Guard deploys to Missouri Jump to media player The National Guard has been deployed to Ferguson, Missouri, following days of civil unrest after the police shooting of an unarmed black teenager. Over a week after teenager Michael Brown was shot and killed by a police officer in Ferguson, Missouri, events there remain fluid and tense. In response, the Pew Research Center conducted a poll at the weekend to gauge how Americans view what has happened in Ferguson. The poll's results shows an America divided along racial and political lines over the complex issues at play in the shooting's aftermath.